With Amazon, eBay, Walmart and other large Ecommerce giants battling for online dollars, brands selling products on these sites look to outrank the competition by securing a coveted page one search engine ranking. To get there, some brands focus on optimizing keywords and getting more five-star reviews. Forward-thinking brands take a holistic approach, adding videos to educate potential customers, gain trust and make more sales. Content Analytics, the leading Ecommerce optimization platform, conducted their own research to see how item pages perform with and without video, the findings were astonishing: item pages with video were 200% more likely to appear on page one. At Sharp Eye Animation we’ve seen clients use our videos as enhanced content to help them get to page one. In fact Mainstays, a Walmart furniture brand, partners with us to produce animated product videos, such as this. The video takes a fun approach to educate viewers on the benefits and features of their 14’’ foldable bed frame. 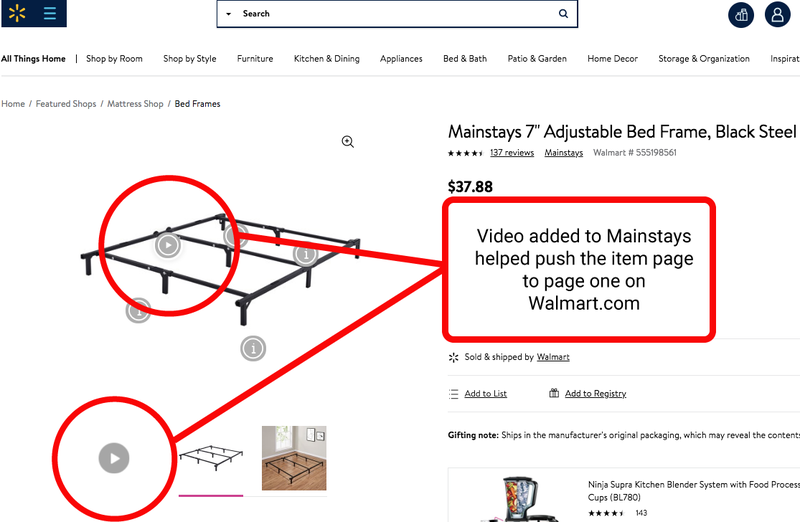 The video was added to the item page and is a best seller listed on page one of Walmart’s website. If you’re looking to improve your enhanced content and your content analytics score, Sharp Eye Animation has you covered. We’ve expanded our capabilities, brought on new animators and have become a trusted source of custom animated videos. To get started on yours contact us or tell us about your project by submitting our video project questionnaire.